December 6, 2011 — New York, NY — Written by Aasif Mandvi (The Daily Show with Jon Stewart) andJonathan Bines (writer, Jimmy Kimmel Live!) 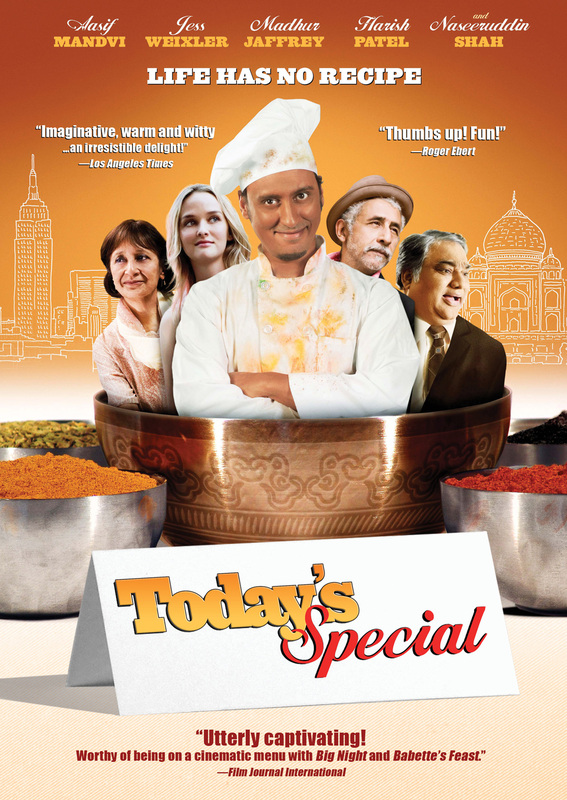 and starring Mandvi, TODAY’S SPECIAL tells the story of Samir, a sous chef who dreams of becoming the head chef at an upscale Manhattan restaurant. When he is passed over for a promotion he impulsively quits and lets his co-worker, Carrie (Jess Weixler, Teeth), know that he intends to go to Paris and apprentice under a master French chef. Dreams must be put aside, though, after his father Hakim (Harish Patel, Run, Fat Boy, Run) has a heart attack and Samir is forced to take over Tandoori Palace, the nearly bankrupt family restaurant in Jackson Heights, Queens. Samir’s mother, Farrida (Madhur Jaffrey), is consumed with trying to find a wife for her son, while Samir is trying to master Indian cooking to salvage the family business. Luckily, he crosses paths with Akbar (Naseeruddin Shah, Monsoon Wedding), a taxi driver, passionate chef and worldly raconteur. Akbar inspires Samir and teaches him to trust his senses more than recipes; to stop measuring his life, and to start truly living it. With Akbar’s guidance, Samir has a chance to rediscover his heritage and his passion for life through the enchanting art of cooking Indian food. Directed by David Kaplan (The Year of the Fish), TODAY’S SPECIAL won hearts and stomachs across the country during its theatrical premiere in 2010, earning «««« from The Dallas Morning News, The Chicago Tribune and The Minneapolis Star-Tribune, among other accolades. Jaffrey, also an actress, was recently included in The New York Times’ “2010 Best Cookbooks of the Year” for At Home with Madhur Jaffrey. Cameos in the kitchen include Kevin Corrigan (The Departed, Buffalo ‘66) and Dean Winters (Oz, Rescue Me). 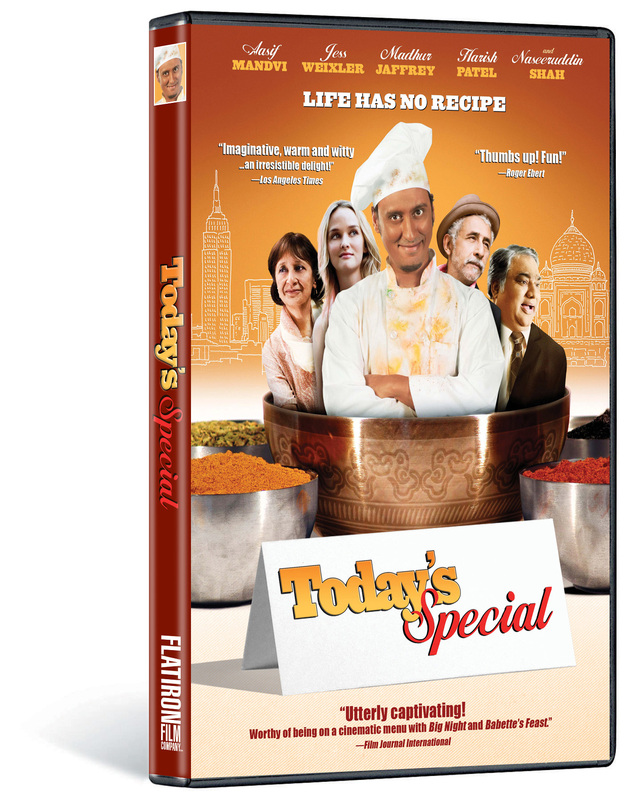 TODAY’S SPECIAL features an original score by world-famous “gypsy” guitar player, Stephane Wrembel(Vicky Cristina Barcelona), and Goldspot frontman, Siddhartha Khosla (And The Elephant is Dancing), composed and performed songs for the film. Celebrating its 20th anniversary in 2011, New Video is a leading entertainment distributor and the largest digital aggregator of independent content worldwide. Headquartered in New York City, with an international presence in 45 territories, the company delivers feature films, TV programs and web originals via digital download, streaming media, video-on-demand, Blu-ray and DVD, and theatrical release. New Video streamlines the distribution and marketing process for filmmakers, producers and brand partners to bring a wide variety of fresh content to new audiences. New Video recently launched Flatiron Film Company as a distribution brand for out-of-the-ordinary, often risk-taking films and original content. Recent titles have included the Oscar®-nominated animated film, The Secret of Kells, web originals Dr. Horrible’s Sing-Along Blog, Red vs. Blue, and Felicia Day’sThe Guild, Joseph Gordon-Levitt’s hitRECord RECollection, and the theatrical release of José Padilha’s Elite Squad: The Enemy Within. www.newvideo.com.